Food is central to Chinese New Year. Discover new and traditional dishes across Asia that usher in this auspicious season. Lunar New Year celebrations have always brought families together. Nowadays, families and friends alike celebrate at home and in hotels, and look for both new and traditional dishes. In Thailand and Laos, they celebrate Songkran by splashing water as a sign of purification. In Vietnam it is known as Tet, and in South Korea it is Seollal. Each has its own unique food for the occasion, such as the Banh Tet (steamed rice with mung beans and pork wrapped in banana leaf) in Vietnam, while Laotians might enjoy pouhn pa (seabass with chargrilled eggplant and chilli). Across China, the spring festival that marks the start of the new lunar calendar is celebrated with firecrackers, hong bao or ang pow (red envelopes), new clothes, and of course festive food. Delicacies such as rou gan or bak kwa (grilled, sweet dried meat similar to jerky) and nian gao (glutinous rice cake) are common during this season. In China, banquets abound with symbolism, with longevity noodles for long life, fish (yu) as a sign of abundance, fried spring rolls which represent gold bars and prosperity, and dumplings shaped like silver ingots. These dumplings (jiao zi) are packed with minced meat, cabbage and spring onions –but never pickles because that suggests that the future will be sour. Originally from the Song Dynasty (AD 1132–1279), pen cai (big bowl feast) is a luxurious dish of braised pork, chicken, mushrooms, prawn, abalone, scallops and vegetables, which has also found its way to this region over the last few years. In Singapore and Malaysia, Chinese families toss a salad with raw fish (yusheng) high in the air – the higher it is tossed, the greater the prosperity will be. They all celebrate the same thing: the wish for good fortune in the coming year. Hotel buffets are proving to be a popular choice for families during the festive season, reported The Straits Times in Singapore. One chef estimated that revenue during the two-week Chinese New Year period increases by at least 50%. Across ASEAN, buffets allow hotels to cater to a variety of guests’ tastes, satisfying those who want a traditional meal with food symbolic of the Lunar New Year, as well as diners hankering after a new experience. Made for Chefs by Chefs, Knorr now borrows from the best of Knorr's heritage in China with Knorr Concentrated Chicken Bouillon. 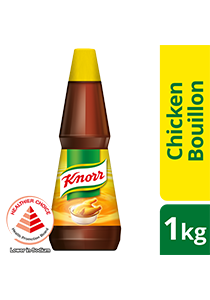 Knorr Bouillon gives natural chicken flavour and aroma and boosts strong meaty flavour to your dishes. A perfect meaty bouillon for making stocks & soups.